Just moments before impact, Kaguya's HD camera took this picture. Lunar hills loom in a seemingly distant background. 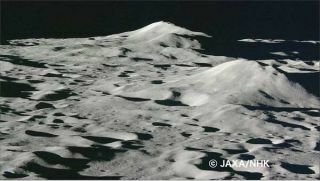 The Japanese space agency, JAXA, today released a series of images that document the final moments of the Kaguya lunar probe just before it slammed into the moon last week. The images, released a day after NASA launched its own moon-slamming mission, reveal a now-familiar pockmarked landscape, desolate and with stark shadows, all up-close as the spacecraft sinks lower and lower toward its final resting place. There is an increasingly somber feel of the photographs as Kaguya slides into darkness and demise, aiming at a landing site on an unlit part of the moon. The intent was to end the mission with a controlled crash that could be observed from Earth, which was accomplished. On LiveScience, the series of final photographs have been put into a "Farewell, Kaguya" Album. Kaguya was launched on Sept. 14, 2007. Kaguya beamed back a spectacular movie earlier this year of Earth eclipsing the sun as seen from the moon. It also provided fresh data on the composition of the moon's mysterious far side. NASA launched two U.S. probes to the moon late yesterday. The mission is sending a powerful lunar orbiter that will arrive Monday, and a pair of impactor probes slated to crash into the lunar south pole on Oct. 9 to search for evidence of water ice.